A throatless (beverly) shear for $150: These will cut sheets of metal accurately and much faster than a bandsaw. The thread on CD even shows it cutting through 1/8″ aluminum. Digital Calipers for $17: We need more accurate measuring, especially for CAD models of physical parts. Better metal shears for $10: Sometimes we cut thinner aluminum and other sheets, we could do this by hand easier. Two-handed riveter for $20: This is usable anywhere, including the pit, but gives some extra leverage to setting rivets. Additionally it has a bottle that collects the waste. New flush cutters for $5 each: We need some new sharp flush cutters for electrical work and clipping zip tie ends flush. New wire strippers for $24: Our wire strippers have seen better days and mangle wires frequently. Big crimpers for $30: We don’t have good tools for crimping large wires like battery cables. Square Crimpers for $21: Our round crimpers don’t always work very well and we end up with badly crimped ends. Hole-Grip Clamps for $12 for pliers, $1.80 per clamp: These are essentially pins that can quickly and temporarily take the place of a rivet or bolt. Useful for assembly or temporary setups. Can also use these pliers with some Spring Clamps too. Noga Deburr Tool for $14: For cleaning up plastic, aluminum and steel edges. It’s handheld so we could bring it to competition too. Laser tachometer for $20: We could actually know exact RPMs of belts, chains and wheels! Loctite Threadlocker Stick for $20: A glue-stick version of thread locker, many teams mentioned this one. Sliding extrusions for structure and linear motion: Our team has always struggled with linear motion. I believe an investment in a sliding extrusion system with v-channels could really help our abilities in this area. Roller Chain: I think it may be time to raise our roller chain game and get better at it. The DarkSoul #25 chain breaker would allow us to no longer use master links, and there are lots of accessories we could use and even options to anchor chain to surfaces (for an elevator, for example), and different tensioning strategies. I think we should consolidate on #25 chain and get very proficient with using it for different types of mechanisms. Versaplanetary Gearboxes: We’ve dipped our toe into using these, but I’d like to go all-in. They are great for auxiliary functionality on our robots (intakes, arms, mechanisms of all types). And the ratios are easily configurable. Let’s get a good set of ratios and adapters for different motors, shafts, and hubs. There’s a good CD discussion on what ratios to get. Sliding lock with bushings for $3 each: These things are amazing! Teams use these for bumper mounting, and for quick-disconnecting of modules on their robots. I’d love to start using these in our designs. If you want to see how they are used take a look at this example. Clip nuts: We really need some of these for those hard-to-reach places we need a bolt. How many times have we had a use for these and had to suffer unnecessarily?! Captive nuts are another option. Sleeve Bearings: These would allow us to reduce the size of our mechanisms and axles so we don’t have to step drill bearing plates like we’ve been doing a lot lately. Piano hinges: These are more adjustable than the standard hinges we’ve used in the past. Also in clear polycarbonate! Rollers: We need to get better at game piece intake and manipulation. Having a good selection of rollers and such can help that. Pressure-Relief Valve for $5.26: Protects against damage to pneumatic components from too much pressure. These and the norgren ones are the only legal components for the 125 PSI pressure limit. And the norgren ones cost $45 each. 2 Meter Distance Sensor for $18: These would be super useful for lining up on field elements for scoring or feeding. Very useful for every year. Tapeswitch sensors: Good lead on contact sensors that look durable and can be trimmed to length. LED Driver for $40: While it’s a little pricey, it would fit all our LED needs for the robot, with multiple patterns that we can easily trigger from the robot code. Not only good for theme/imagery, but also useful for human player signalling of current robot mode. XT60 Connectors: These are a cheaper paired alternative to Anderson Powerpole connectors. Maybe we should consider trying them out instead? Low Friction Tape: Used for surfaces that slide against each other. Disk brakes: This one’s pretty far out there, but I thought it was interesting. There have been times where we wanted to be able to stop rotation. This could be used for drive, yes, but more importantly it could be spring-loaded to stop a climber from falling, but with a manual release for taking the robot down after competition. Annular Cutter: A high quality (and high price) cutter designed to cut on-point holes in a range of sizes. I was thinking to use them to cut bearing holes to the correct size. We would want to look into one that could cut 1-1/8″ holes and has a pilot pin. Cutting Coolant: This could be used in multiple applications including the band saw in steel, large hole saws and annular cutters. New Band Saw Blades: Thinking replacements for the horizontal/vertical and the small vertical band saws. Polycord: On the same note as the rollers mentioned in the supplies section, polycord is another great way to make conveyor belts and manipulators. They would be used in a similar fashion as the current surgical tubing, but they do not flex nearly as much making them a more viable option for conveying game pieces. Here is a great example of these in action. There will be more once we get more ideas finalized and organized. 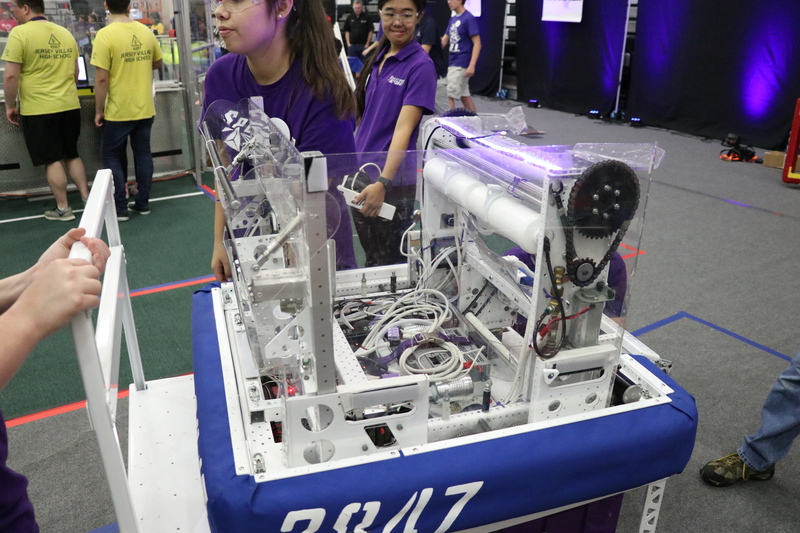 Drive Team debriefing after a match. Inky (left), Juanito, and Pac-Man walking around Competition pepping up the crowd. System Meltdown after a great kickoff event hosted by Barstow. Kevin (left) and Steve testing out the mustaches for the hats at Competition. Team ready for a great year of matches at the Greater Kansas City Regional.